Using a revolutionary, or at least it was back in 1988, leveling system, Infernax is an old school adventure platformer game with puzzle elements. It's a whole new innovative style and since nobody has ever done anything of the like, we'll name it ourselves, ARPG, which stands for Awesomely Radical Playing... Game, patent pending. All kidding aside, we tried to capture the essence of the games that left a mark on our childhoods, the ones who lit up the spark that made us want to make games of our own. This is a recreation of that experience we had growing up playing obscure NES games, the kind of game that left you with a feeling of accomplishment once you beat it, several months after the initial purchase. Want to see how we do the things that we do? Want to interact with our team and our community? Do you not care about any of that but just want to win free junk? If any of that tickles your fancy, come on by our twitch channel every weekday around noon EST and watch us do some super entertaining dev stream while our buddies in the chat make lewd jokes and argue about the most random things! As for the free junk part, every Monday we raffle things and stuff, sometimes ours, sometimes not, tune in to know which! 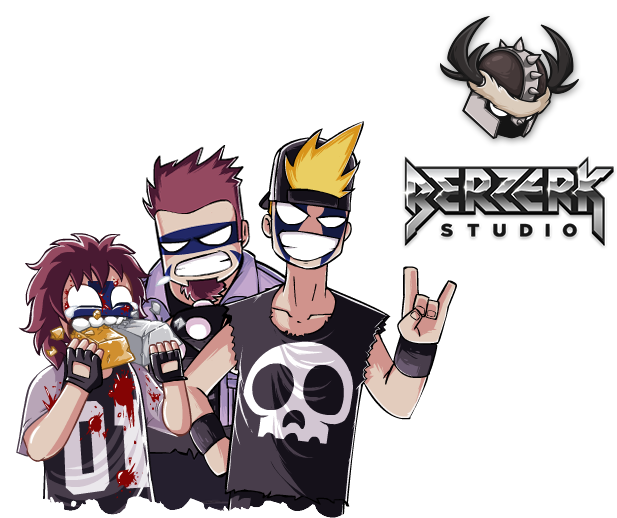 Berzerk Studio came to existence seven years ago after the three founders, Étienne, Marc-Antoine and Simon decided to leave their previous Studio. After years of excelling in cute toy related flash game for kids, they took the next logical step: making brutal Viking related games with copious amount of pixelated blood and various silly hats, first aiming for consoles but soon realizing that the world just doesn't work that way. Copyright © 2015 Berzerk Studio. All rights reserved.